'I see no harm in applying rigorous analysis to systems of belief. On the contrary, it seems to me a good and useful thing to do. I do so for my own beliefs and feel no sense of threat when others do the same. I admire and enjoy the works of Richard Dawkins and Christopher Hitchens who regard all religious beliefs as absurd and dangerous delusions. They are intelligent men who write, and argue their cases, well. I agree with much of what they say and would be happy to debate amicably with them over points of disagreement. As an intelligent, enquiring Pagan, I do not see blind faith as being an adequate substitute for provable fact or observable reality. My own beliefs are based on observations that have been subjected to repeated analysis over a period of half a century or so, as a result of which they have continually changed and evolved as new information has become available and new observations have been made. 'By contrast, some adherents of the big three monotheisms seem to feel deeply and personally threatened by any attempt at objective analysis of the background to their faiths, or any deviation from those faiths, often responding with death threats or actual violence, up to and including murder on an industrial scale. 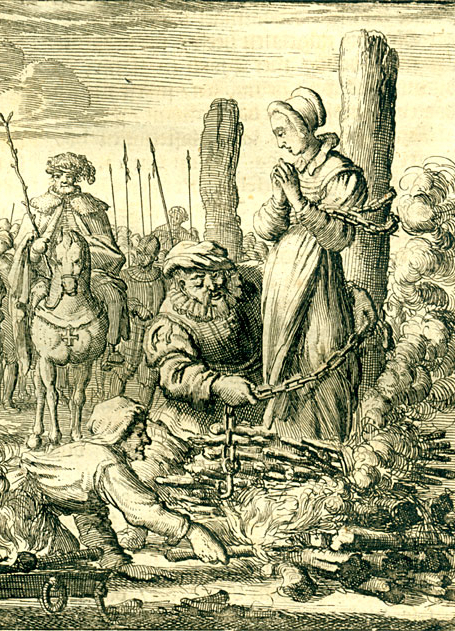 The history of Europe is littered with examples of the latter, from the murder of pagan priests in late Imperial Rome, through bloody campaigns against Christian heretics (right) and 16th century Witch-hunts to the Nazi Holocaust. 'The underlying cause of such deep-seated and destructive insecurity can only be fear; fear of change allied with a fear of being shown to be wrong. What is wrong with being wrong? Surely the path towards ultimate truth requires us to question each step along the way, rejecting those that prove wanting so that we can move on? 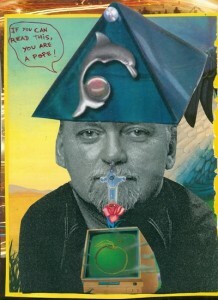 'The difference here is one that has been characterised by Robert Anton Wilson (left) as that between dogma and catma. Wilson, co-author with Robert Shea of the Illuminatus! trilogy (Dell Publishing, 1975), said that “Discordians don't have dogmas, which are absolute beliefs; we have catmas which are relative meta-beliefs.” In other words, religious dogmas are regarded as absolute and therefore restrictive of freedom of thought, while Discordian catmas, through not being hard and fast but constantly subject to change and revision, actively encourage freedom of thought. 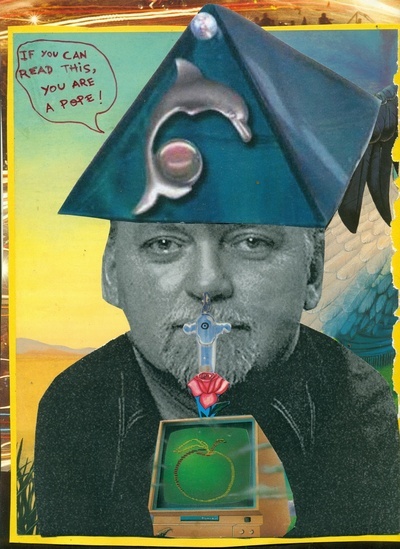 Discordianism is an absurdist, surrealist, Dadaist religion that Wilson, Shea and others created inspired by the philosophy and spirituality of late 1960s youth culture. I find the idea of catmas admirable and inspiring, while I have always had a problem with dogmas, which is why the BDO promotes the former and rejects the latter. We both expect and encourage you to regard our course material as a series of catmas that you can either take or leave depending on how well or otherwise they resonate with your own experience of the world. We actively encourage a questioning approach to the world in general, and anything we say in particular. If we truly learn by our mistakes, then I must have learned a lot over the last few months whilst struggling to master the art of drum-making. There are workshops up and down the country in which you can learn the necessary skills, but, as ever, my guiding spirits led me to do it the hard way. 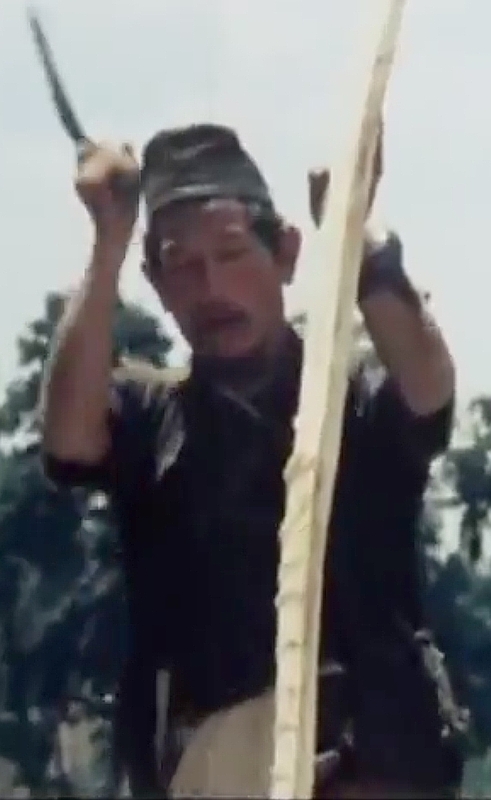 My initial inspiration for wanting to try came from a film I first saw many years ago called The Shamans of the Blind Country (1981, directed by Michael Oppitz - scroll down to watch it), about shamans in a remote region of Northern Nepal. 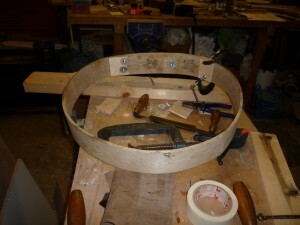 A group of them set out with a young apprentice to help him make his drum, the most important tool of his trade. First, he must dream of a tree, then lead his elders to it in the physical world. Next, to ensure that he has found the right tree, he must sleep by the base of its trunk and report any dreams he has to the elders next morning. Only if they agree is the tree felled. He found a tree, the dream was good, the tree was cut. The young apprentice and his companions then split it to make two rough, thick planks and set off back towards their village carrying them, stopping every now and then to reduce their thickness and smooth them down using a billhook, an adze and a machete (left). They make two in case one breaks when they try to bend it. Wise advice. They dug a circular pit the size of the required drum and banged a circle of wooden stakes into its floor. 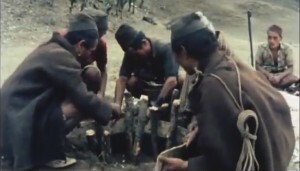 One of the prepared planks was then held over a fire for a few moments (right), after which one end was hooked into the staked hole and the remainder bent around the stakes (left). When the two ends overlapped, the whole was tied tightly around to hold it in shape. It was then fixed with iron nuts and bolts, the local belief being that iron is a powerful, magical material. This all looked reasonably simple. Ha! If simple is what you're after, buy ready-cut timber. If you want even simpler, you can buy ready-made drum hoops online for about £30. I decided to find a tree. Here it helps if you have friends who live in 80 acres of woodland. I am so blessed. I was led to a thickly wooded bank where I found a couple of tall, straight trees that looked about the right size. 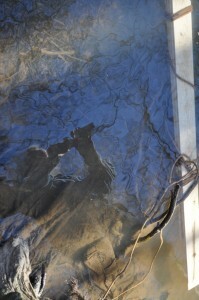 However, when I placed my hands on their trunks, I got no indication from them that they were willing to work with me. I moved on and found an Ash tree that looked perfect and was located right next to a broad path. This time, when I touched the tree (right), a buzzard rose up from the trees a little way off, took to the sky and flew overhead towards the West. Further confirmation of the rightness of this tree came when felling it. I cut a notch into the downhill side with a billhook then sawed through the trunk from the other side with a bow saw. The saw went through it with amazing ease and the tree fell perfectly down the side of the path. 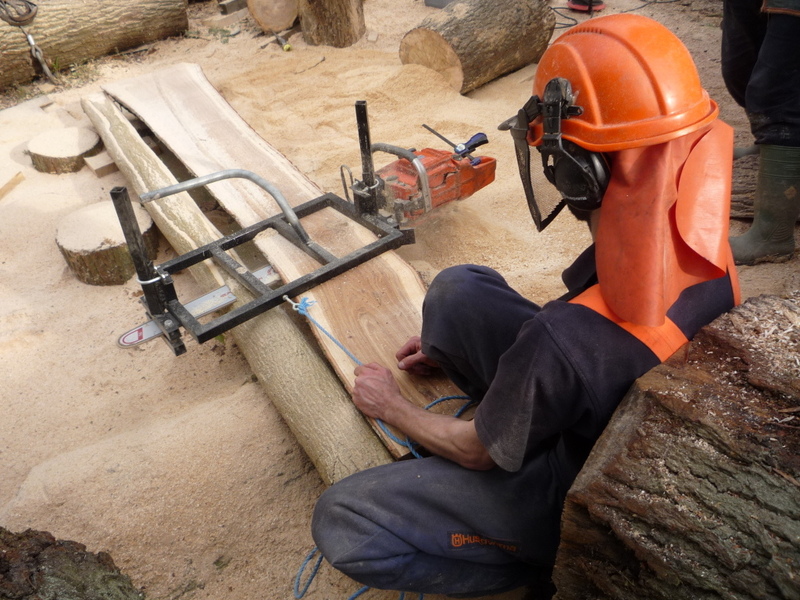 I had thought of attempting to split the logs myself and pare them down to the required thickness using an adze. 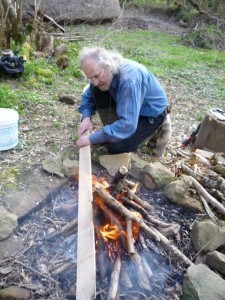 However, while building a roundhouse a few years ago, I'd tried log splitting using a billhook and mallet. It was a hopeless failure, the split twisting in all directions. 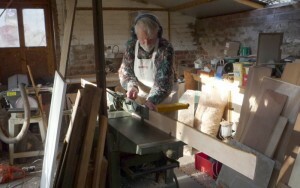 I decided then to take up the kind offer of local all-round handy-man, Ben, and resident cabinet-maker, Garth, in shaping the wood. Ben has an ingenious chainsaw rig that did the initial cutting (left), while Garth's workshop (below) provided the tools and expertise to produce strips of timber 9 feet long, 3 inches wide and ¼ inch thick. 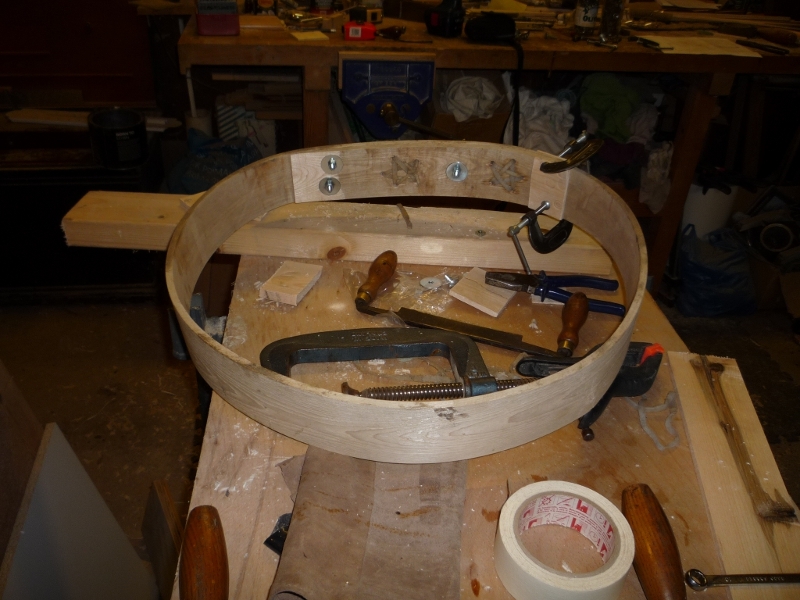 The actual length needed to make an 18” diameter drum is about 5 feet, but you need an extra foot or so to give you leverage during bending and, as an absolute beginner, I wanted to err heavily on the side of caution. It was after the timber was sliced to size that I made my first mistake. It was beautifully flexible and I should have bent it there and then. However, it was the end of a long, hard day and mealtime beckoned. I thought the timber would be OK overnight. I was wrong. By the next morning it had lost most of its flexibility. 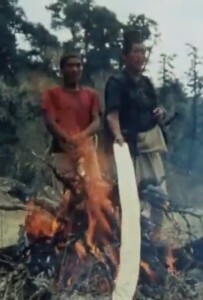 Nevertheless, I took the four cut lengths down to the roundhouse and tried the Nepalese shamans' technique of cooking it briefly over an open fire (left). I transferred it to my circle of stakes and tried bending it. It hadn't gone round much more than the first couple of stakes before it broke. OK, that wasn't going to work then. I'd seen another film online in which a Native American drum-maker had hauled his timber out of a river and, without heating or any other treatment, had successfully bent it around an iron former. Right, let's try that then. Off to the Borle Brook, tributary to the River Severn with its inhabiting goddess-spirit, Sabrina. Roped the three remaining pieces together, weaving rope between them so that water would be able to circulate all around them, and put them into the Brook, holding them underwater using a conveniently placed tree root at one end and a rock at the other. The guy in the video neglected to say how long he soaked his timber for, so I figured I'd leave mine overnight and then try it. Obviously not long enough. Another break. Left the remaining two another night, then tried again. One broke, the other, with a bit of help, held. Hooray! Well, it had one split that was caught and clamped to some of the extra length I'd cunningly left. Even so, back at the workshop, I had to resort to using bolts to hold it together as well as the rawhide thongs I'd intended to use. This held it together, though at the expense of increasing the weight. Nevertheless, I had my first useable drum hoop (above) and, in fact, given that my original inspiration had been th e Shamans of the Blind Country, the presence of the steel bolts was appropriate: in their part of Nepal it is traditional to add iron to every shaman's drum hoop for its magical protective properties. I helped Garth reduced the second log to five strips of the required size. These were again roped together and placed in the caring waters of the Brook. Then I had to go home. Tune in next time for the further adventures of a Druid drum-maker. Most of the photos are by Elaine Gregory and a couple by me, apart from the screen-shots from Shamans of the Blind Country. In our increasingly materialistic world, an ethical question that plagues many of us who try to live as persons of spirit is that of whether, and how much, to charge for our services. 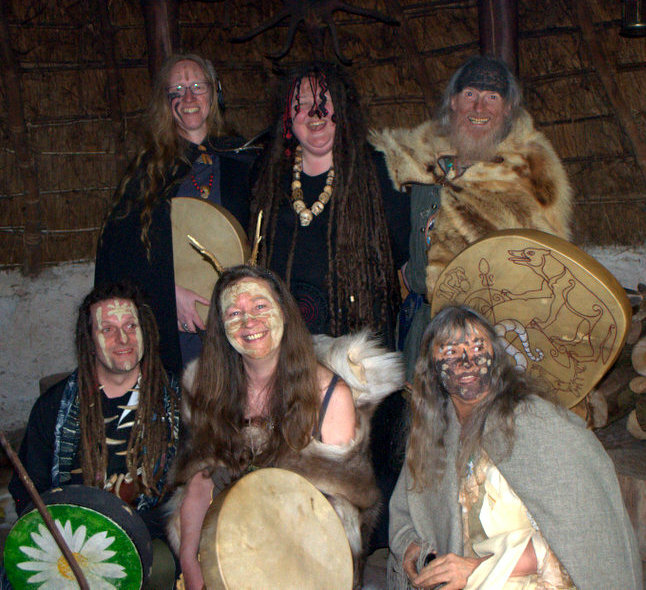 A vocal section of the Druid and Pagan communities in Britain maintains that it is always wrong, verging on evil, to charge a fee for anything connected with spirituality. A cynic might argue that some who express this opinion do so because they expect to be given everything in life and to offer nothing in return. However, the same argument rages amongst Druids themselves, as it does amongst other indigenous healers, medicine people and shamans around the world. The problem is that we live in a capitalist, consumerist culture, where, like everyone else, we have to pay rent or a mortgage, electricity, gas, water and telephone bills, feed ourselves and our families, buy fuel for our stoves, clothes to wear and so on and on and endlessly on. To do so, even the most spiritual of us need money, because, for better or worse, money has come to be the accepted means of exchange for virtually every material thing we need to keep us fed, housed and clothed. Therefore we need a way to make money in order to live. 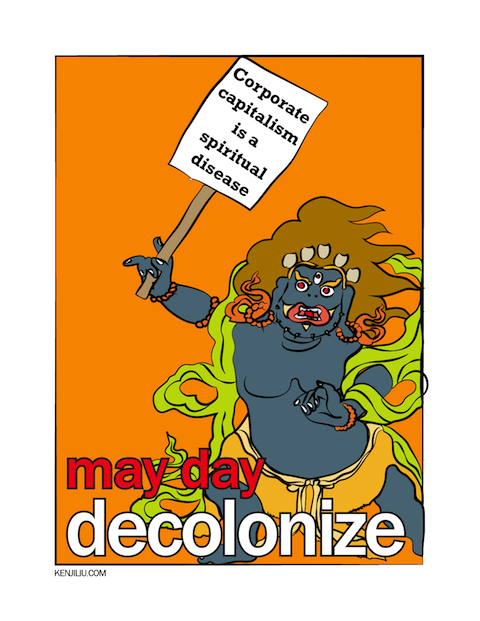 Many spirit workers subsidise their spirituality by having other jobs that they do to earn their keep. I've done this myself, subsidising the growth of the BDO throughout the 1990s out of my earnings from painting pottery and then from writing, giving talks and workshops and appearing on TV, often with Bobcat (Emma Restall Orr). Bobcat and I debated the financial question and reached various conclusions, one of which was not to charge a fee for 'priestly' services such as conducting handfastings (Druid weddings) or other rites of passage, but to ask for a donation of whatever the folk we were working with thought appropriate. This led to us preparing and conducting rites in various parts of the country for anything from a bag of apples to a cheque for £600. It balanced out. This is a technique used by spirit workers in many cultures. Many of my 'shamanic' friends say that, if you have faith, spirit will provide. Again, this is a widespread belief amongst spirit workers worldwide. At the same time, we're all canny enough to recognise that just sitting around waiting for riches to pour out of the sky isn't going to work. We need to be active participants in the process, from deciding on the forms ceremonies are to take to making travel arrangements and booking venues. In the British Druid Order, we charge for the distance learning courses we offer. We could give them away, but we don't. Why? Well, I've spent an average of about 40 hours a week working on them over the last seven years and still have at least another eighteen months to go. For six of those years I received nothing at all for this work. Even at the national minimum wage of £6.32 an hour, I could have expected to earn over £75,000 or £12,500 a year. I did it without payment because it seemed like the right thing to do and it was also a good thing to do, in part because of what I learned from it and gained in terms of personal growth. Oh, and because I doubt that the BDO has generated £75,000 in its entire 35-year existence. Following my wife's death in 2000, I received financial support that enabled me to put in all these hours on the courses whilst bringing up our two sons. Only when that support ended did I, out of necessity, begin to draw any payment from the BDO. Given that the BDO courses are relatively new (our first went online in June 2011) and unknown (we only began to advertise beyond our own websites when our second course went online in 2012), the BDO does not produce much revenue and the amount I draw from it comes nowhere near covering my family's living costs. As I write, myself and two of my sons are living on my savings. I keep working on these courses, however, because I believe in them, and part of that belief is that they will one day generate a living wage sufficient to keep me through my rapidly approaching old age. My BDO colleagues and I spent about a year and a half deciding how much to charge for our courses. Should we charge a token amount just to cover admin? Should we charge the same as OBOD? No, because our digital delivery doesn't entail anything like the overheads and secretarial costs that OBOD has. But pitch our cost too far below OBOD's and we risk upsetting people who might think we were deliberately trying to undercut them. In the end, we settled on a compromise figure that more-or-less satisfied everyone, and we do consider requests for reduced fees in cases of genuine financial hardship. How much to charge for individual events is also a cause of much debate within the BDO. My parents never had much money, I was raised to be frugal and, in my hippy youth, lived for some time on nothing but the kindness of strangers. The result was the malnutrition that contributed to my mental breakdown at the age of 18, but that's another story 😉 As I've tried to make clear, my motives for being a Druid are not financial. 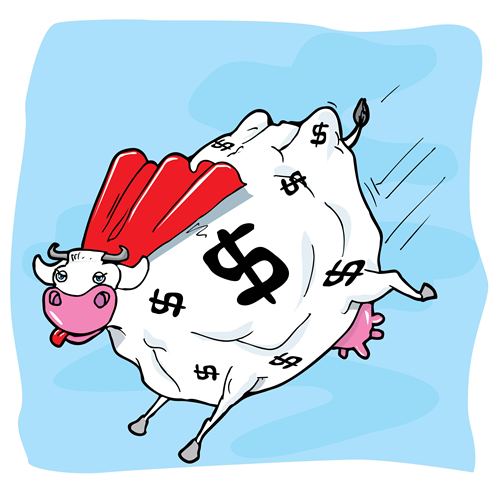 I'm reminded of Robin Williamson's joke, “Did you hear about the Irishman who became a folk musician for the money?” Druidry is not a cash cow. However, if they're well-planned and conceived, Druid events can make a bit, or at least break even. 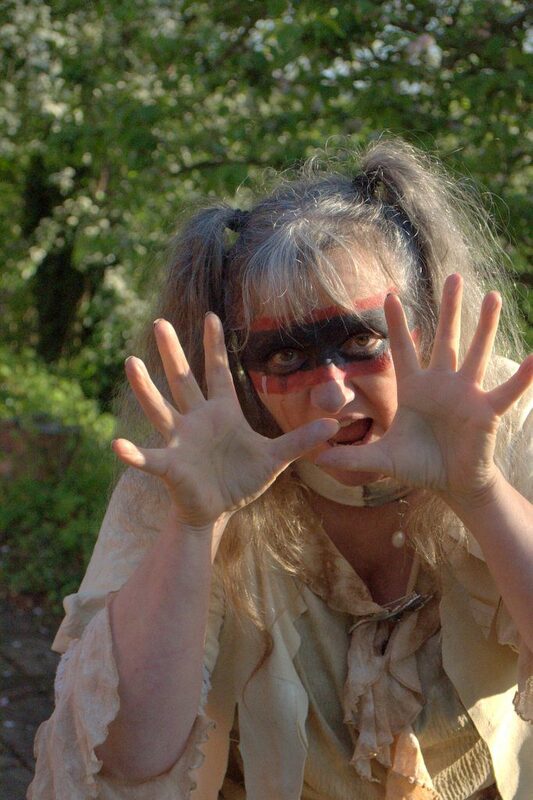 When Elaine Gregory and I, ably assisted by many wonderful friends and colleagues, hosted The World Drum in April 2013, we took it to ceremonies all around the West and South-West of Britain for six weeks, culminating in a wonderful weekend at Wild Ways in Shropshire. Most of the ceremonies were free. Two events were charged for. 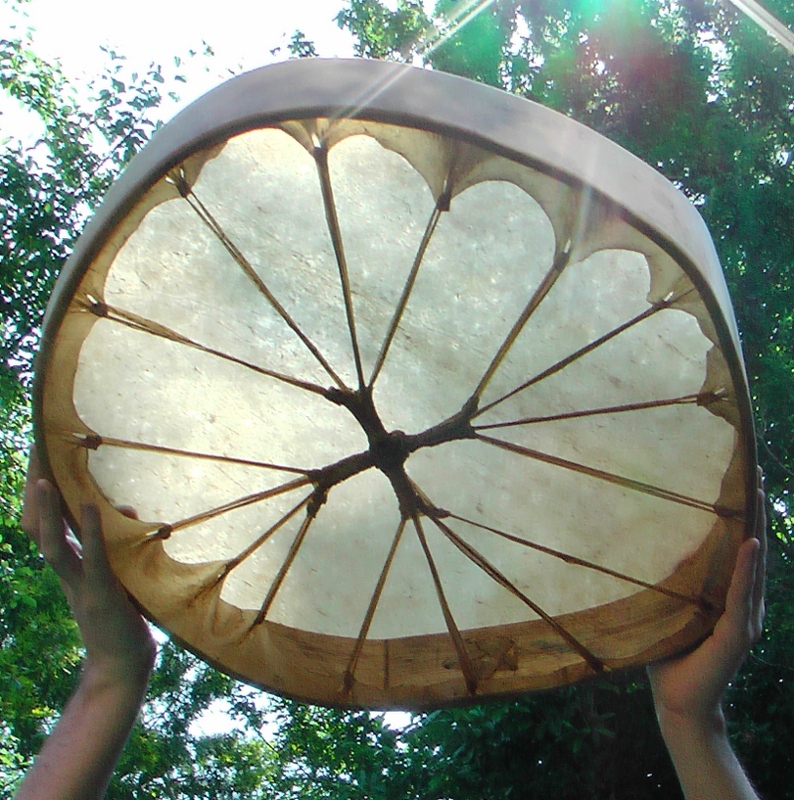 At the end of the time the Drum was with us, we managed to break even and were delighted to do so. Part of the reason we were able to charge so little for the World Drum 2013 events is that many of our teachers and musicians gave their services for nothing, including World Drum founders, Kyrre Franck White Cougar and Morten Wolf Storeide, and their friends, Lena Paalviig Johnsen and Will Rubach, who travelled over from Norway at their own expense to bring us the amazing Chaga ceremony and to be with us in other ceremonies with the Drum. In May this year, White, Morten and Lena are coming back, accompanied by Bobby Kure and Anita Dreyer, members of the shamanic band, Baalfolket. This time we hope to make a few quid. We obviously need to in order to cover the hire of two venues, travel expenses and other basic costs, but we also want to be able to pay the guys something for coming over to the UK for 12 days. Like us, they have to have money to live. I even hope to make a few quid myself to compensate for the many hours work involved in putting these events together, producing leaflets, visiting venues, generating advertising. And why not? If I were doing these things in any other sphere of activity, no one would bat an eyelid at my being paid a reasonable sum for my time and expertise. Why then do I still feel vaguely guilty about it? Partly, it's a hangover from my impoverished youth, partly it's because I view the whole capitalist enterprise as deeply and irrevocably flawed. It rewards the basest of human motives, relying on the vast majority of the world's population having next to nothing so that a tiny, obscenely wealthy minority can lord it over the rest of us. It stinks. No wonder I feel guilty. It baffles me that anyone doesn't. And yet, as said, until we demand and get a better, purer, more equitable way of running human affairs, my family and I need money to live. For most of the existence of classical Druidry, of course, we were supported by the warrior aristocracy of Iron Age Europe (OK, this guy may not look like a patron of the arts, but take my word for it, he loved nothing better than a finely honed poem), a patronage that was transferred to the bardic colleges of Ireland, Wales and Scotland. We were part of society's elite, fed, housed, clothed, provided with musical instruments and given high social status because our services were deemed worthwhile. We sang for our supper … in the case of bards, literally. 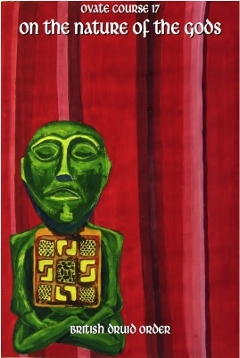 We advised kings, divined, prophesied, oversaw ceremonies, told tales of gods and heroes, judged legal disputes, healed the sick, created poems of praise or blame, and, for many centuries, were both honoured and handsomely rewarded for doing so. We still do many of these things, but without either the social status or the payment, bed and board that came with it. We are, instead, looked upon as colourful eccentrics at best, dangerous loonies at worst, occasionally despised, more often simply ignored by our wider society. Hence our need to find new ways of making a living. Druidry is no longer viewed as a job but as a hobby. For some of us though, it wholly defines who we are and what we do. For this minority of driven individuals, Druidry is our calling, and one that we see as every bit as valid and valuable as more recognised fields such as traditional teaching or medicine or, of course, priesthood in the more mainstream religions. I very much hope that our courses demonstrate both the breadth and the worth of Druidry. I know from my own experience that Druidry can and does regularly transform and even save lives. The Druid Network undertook a three-year campaign, the result of which was to have Druidry as they understand and practice it recognised as a valid religion, the Druid Network itself achieving the status of a charity. This status means, among other things, that they can legally accept donations and bequests and have certain tax and planning advantages. Such charitable status for 'alternative' religious groups is commonplace in the United States, where freedom of religion is written into the Constitution and, as a result, has traditionally been taken seriously by legislators. The presence of Native Americans endeavouring to maintain their own religious cultures has also played a part in ensuring that religious balance under law is maintained in the USA. 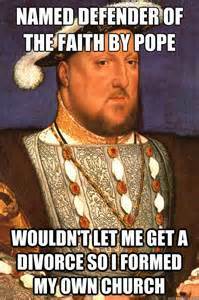 In the UK, on the other hand, we have had a state religion since Henry VIII's decision to abandon Catholicism so that he could get a divorce. This state religion, Anglicanism, as manifested through the Church of England, has, until recently, enjoyed a virtual monopoly on state support and the status and financial advantages that such support brings. However, the Druid Network case does not mean that all Druid groups now have charitable status or official recognition. 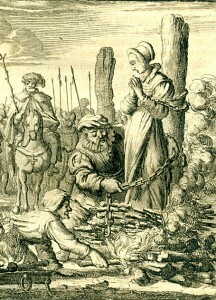 Should other groups such as the BDO decide that charitable status was a good idea, we would need to go through much the same bureaucratic process that TDN went through in order to prove that our brand of Druidry is also worthy of the name religion and that we too have purposes in mind that come under the fairly broad umbrella of 'charitable.' If we wanted to, I'm sure we could, but it would involve precisely the kind of bureaucracy that our current constitution seeks to avoid while gaining us very little. 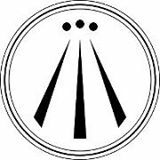 The most successful Druid group in the world currently is the Order of Bards, Ovates and Druids. My friends, Philip and Stephanie Carr-Gomm, have been running it for nearly thirty years. During that time, they have also been running a Montessori School, Stephanie has worked for Glyndebourne Opera House and Philip has written numerous books (some with Stephanie) and lectured widely. It is these latter activities that have kept the roof over their heads and food on the table, not running a Druid Order. Some folk have the mistaken impression that they were making loads of money from OBOD camps. On the contrary, it was only the Summer Camps that ever made a profit at all, and that was used to subsidise the camps in the rest of the year that ran at a loss. 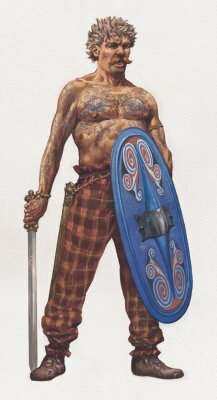 Druidry is not a cash cow, one simple reason being that it is a minority interest, best estimates being that there may be 10,000 Druids in the UK, or 0.01% of the population, though the true figure may be less. There's also the fact that many of us attracted to Druidry and other 'alternative spiritualities' are, to a greater or lesser degree, outsiders within our society, a position that leaves us ill-placed as well as un-inclined to benefit from its capitalist structures and agendas. 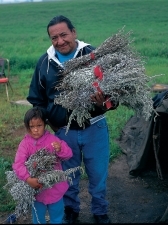 “Prior to 1942, everyone took care of their healers and medicine people. They understood the sacrifices that they made. Today, unfortunately, too many people feel that giving a K-Mart blanket is a sufficient offering for seeking spiritual help. It's a very difficult life that we live. We have to pay bills, have a home, drive a car, and place groceries on the table. “I was always told to ask for nothing. If a person asks you to do a ceremony, they will give you what is needed. The Creator helps you in this way. When you seek the help of a spiritual person, think about the price they pay to help you. “I was taught that you should give to others because the Creator will return it to you. You will get twice as much back as you put out for others. You give because you have compassion for children and for families. So you see it's not just us. Similar views are expressed by spirit workers around the world. The big, organised churches can pay their clergy a living wage because they have, over many centuries, demanded payment from 'the faithful' and expected many of them to leave their entire fortunes to their church when they die. Groups such as Scientology have flourished financially by being arranged as pyramid selling schemes designed to generate wealth for those at the top. The Guru Maharaj Ji, founder of the Divine Light Mission, became hugely wealthy by exploiting his followers, buying himself a fleet of Rolls Royces, yachts, personal jets, etc. Fortunately, such exploitation is anathema to all the Druids I've ever met. I think the answer is that when everyone else stops demanding money from us for taxes, services and goods and adopts a barter system instead, we'll be utterly delighted to do the same. In the meantime, we'll continue to struggle with our consciences and the Druid community will continue to benefit from those struggles as we strive to do everything for as little as we can feasibly manage and still put food on the table. On first visiting the Avebury henge in Wiltshire in the mid-1970s, I came to the same conclusion that the antiquary, John Aubrey, arrived at after his first visit in 1649, which is that Avebury "doth as much exceed in greatness the so renowned Stonehenge, as a cathedral doth a parish church." In scale, it certainly does, Avebury's massive bank and ditch enclosing an area of 28.5 acres compared to Stonehenge's humble 1.9. In spite of having half a village built inside it and being sliced in two by a busy main road, Avebury also retains an extraordinary atmosphere. On my first visit, it felt like an active, living sacred site. As I strolled around the south inner circle, I had a vision in which I saw the body of a grey-haired man lying on a wicker-work stretcher next to the base of one of the sarsen stones. Kneeling by him was a woman of a similar age who I took to be his partner. She was singing a keening song and wafting her hands across the dead man's chest. I got the distinct impressions that she was singing the man's soul into the sarsen, and that this was a common practice among her people. About a dozen other women and men stood in a loose semi-circle around the couple, all facing in towards the stone. Some of them were also singing, while the women were supporting the woman's wafting motions. All were dressed in clothing of rough-woven cloth and skins that suggested they had lived about 4 - 4.5 thousand years ago. 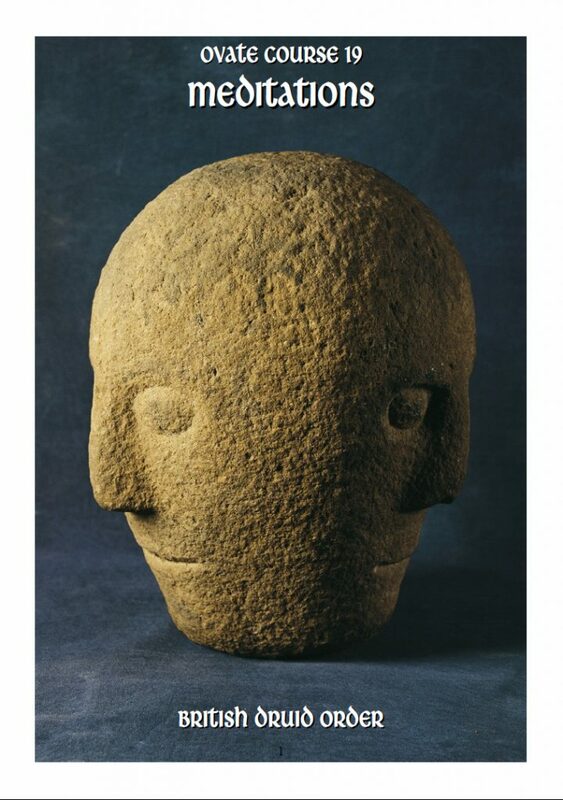 This vision gave me the clear idea that one of the functions of the stones in megalithic circles was to act as soul-shrines, receptacles for the spirits of the dead in which they would reside after death as continuing members of their tribes. It is this vision that I've tried to recapture in the illustration here, made for one of the booklets in the BDO ovate course, one on rituals of death and dying. I began with a photo taken by my son Joe next to the very stone where I had the vision 37 years ago. In it, I play the dead man and Elaine Wildways plays my grieving partner. Since our photo was taken on a bright sunny early afternoon, while the vision was set at twilight, I darkened the sky and some of the surrounding landscape. 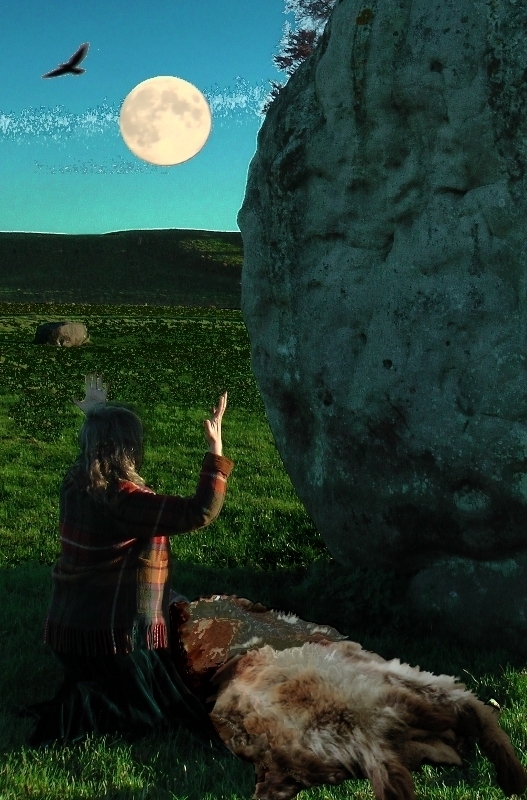 The over-large moon and the rook were added from another photo of Avebury taken at another time. They were added just because I think they look good. The wolfskin covering my body was also added digitally. I also played around with the colours a bit. I thought about including some of the other figures I had seen in the vision but decided not to as they would have partially hidden the central couple. If you're thinking the image really looks digitally manipulated, that's deliberate. There's something about the weird accidents that happen when digitally playing around with pictures that, for me at least, gives them an Otherworldly appearance which is exactly what I was looking for. Intriguingly, the archaeologist, Mike Parker-Pearson, believes that the stones at Stonehenge are soul-shrines, having been led to this conclusion when he invited Ramilisonina, a colleague from Madagascar, to visit Stonehenge in the 1990s. Ramilisonina told him that, in Madagascar, there is a still active megalithic tradition in which the souls of the dead are transferred into stones that are regarded as sacred. He strongly felt that the stones of Stonehenge had the same function. When we finished putting together our bardic course in the middle of 2011, we'd put so much into it that I seriously wondered if we'd have enough material left to create either an ovate or a Druid course. I needn't have worried. Our ovate course is almost twice the length of the bardic, running to about 400,000 words, with most of the 24 booklets being 52 pages long, the most I've found it possible to get a staple through. It's now shortly after the Spring Equinox, 2013, and the ovate course is nearing completion. The first 16 booklets are complete, the next 4 just in need of minor editing and 2 out of the last 4 almost complete. That leaves something like 30,000 words or 100 pages to go, about half of which needs to be written, while the rest just needs formatting and editing. I hope to have the whole course completed at the end of May. As to the content, I couldn't be more happy with it. We have wonderful contributions from Elen Hawke, author of In the Circle: Crafting the Witches' Path (2001), Praise to the Moon: Myth & Magic of the Lunar Cycle (2002), The Sacred Round: A Witches' Guide to Magical Practice (2002) and others. For our course, Elen has written on the lunar cycle and on astrology. 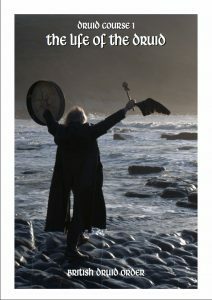 We also have a unique compendium of traditional astrological lore from Seattle-based Pagan priest, Leon Reed. Leon, a magical and medical herbalist for more than 30 years, has also given us the herbal he compiled for use in his practice. Elaine Wildways has written a cycle of seasonal festival rites for us, and also a cycle of rites of passage. We include a funeral rite composed by myself and Emma Restall Orr. Nina Milton and her OBOD group helped us put together a series of tree-based exercises in movement and meditation. Blue Fox has provided several pieces, including a wonderfully-accessible Ogham oracle with a card set designed by your humble author. 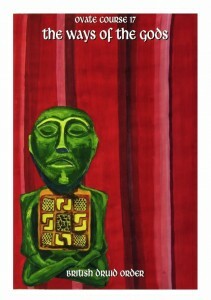 We also have more words and art from Robin Williamson, as we did in our bardic course. It's been a real pleasure to edit such a wide range of well-researched, well-written pieces and I thank all our contributors. I'm even pleased with my own contributions and usually I am extremely critical of my own work. Part of the process of writing these courses has been to go back to basics. I've stripped down every belief I've developed since early childhood and re-examined each one in detail to see if it still makes sense and if it can be fitted into context with others. This process has been both educational and cathartic. I've also re-explored the medieval literature of Britain and Ireland. While I'd been familiar with it for years, looking at it afresh for the purposes of the course led me to understand sections of it in entirely new ways. 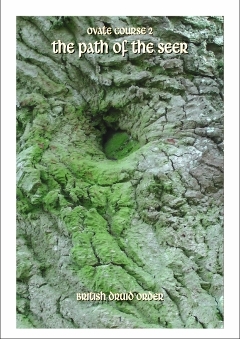 One result of this has been the re-construction of a remarkable healing technique and a set of spiritual exercises and meditations, both based on Irish manuscript sources, though there is evidence that both were also known in Britain and have parallels in cultures much further afield. I'm also pleased with the range of illustrations in the booklets, many created specially for the courses, others sourced from all over the place. One of the great advantages of delivering our courses as pdf files is that we do not have the cost of reproducing so many colour illustrations in print and can therefore include lots of them. Sourcing illustrations for writings on Druidry is by no means easy, particularly if you don't want to just keep using the same ones that everyone else uses. We've out almost as much work into sourcing interesting and information pictures as we have into writing the text that goes with them. The range of subjects covered in the course is very wide, from the creation of the universe and the myths of creation, through birth to death via health and healing, nature spirits, philosophy, astrology, divination, seership, herbalism, group ritual and more, including the ways of the gods. With this course, following on from the bardic course, I think we've achieved a turning point in the history of modern Druidry, raising it to a new level of vibrancy and understanding. And I no longer worry about having anything left to put in the Druid course. I'm pretty sure we'll be OK.
What's the difference between the BDO and OBOD (the Order of Bards, Ovates & Druids)? It's not the easiest of questions to answer. In terms of our courses, for example, I can only compare ours with what the OBOD Bardic Grade and the first half of the OBOD Ovate Grade were like in the early 1990s when I did them. They have since been completely rewritten. I have a copy of the current OBOD Bardic Grade on CD, given to me by OBOD chief, Philip Carr-Gomm, because I contributed a song and some other bits and pieces to it. However, I have only listened to a few clips from it. Why? Not hard. Because I didn't want to be influenced by it in putting together our own courses. So, personally, I don't know what's in the current OBOD courses. However, those who are familiar with other courses, including OBOD's, tell us that ours are very different in both style and content. If they weren't substantially different, there would, after all, have been little point in us spending five years putting ours together. I'm told that, compared to OBOD's, our courses are more overtly Pagan. They are also, I gather, more than twice as long by word count. They are densely packed for a reason. When we undertake any course, we only fully absorb and regularly work with a percentage of the material we're given. By putting so much into our courses, the idea is that more will be recalled and used. Professor Ronald Hutton has suggested that those who have taken OBOD's courses could benefit from then moving on to ours, as GCSE students move on to A levels. 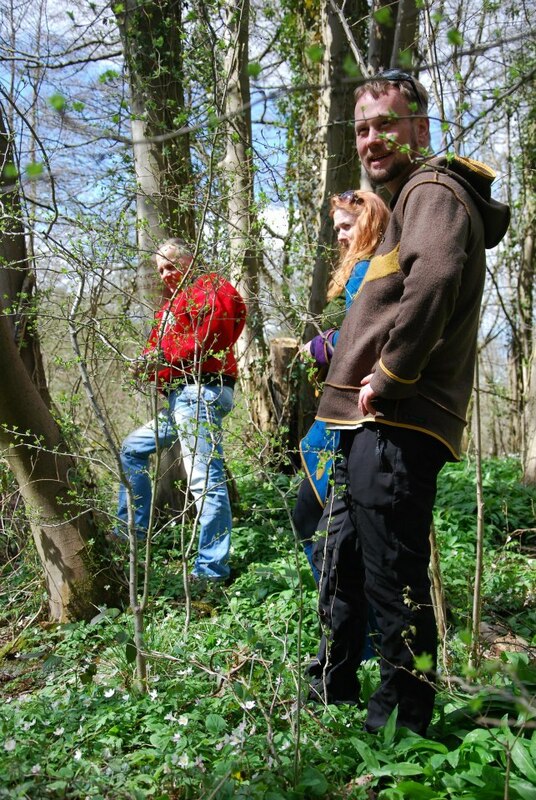 More than most other groups, we see Druidry as the native shamanism of Britain and much of Europe, and that vision is reflected in our courses. We place more emphasis on the traditional areas of study and practice associated with bards, ovates and Druids, i.e. 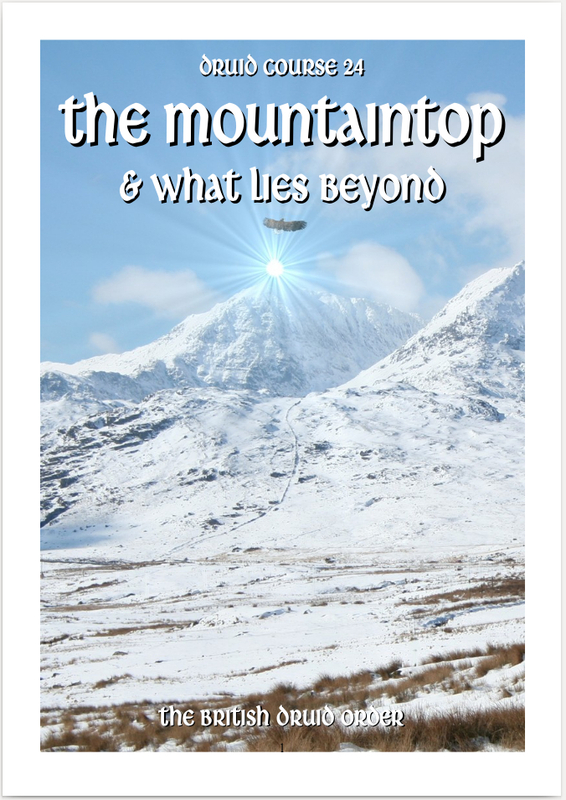 music, poetry, myths, storytelling, history and genealogy for bards; divination, seership, natural philosophy and healing for ovates; constructing and conducting ritual, shape-shifting, weather-working, counselling and moral philosophy for Druids. Unlike other groups, we do not offer set initiations at the beginning of our courses. Instead, we recommend personal rites of passage to be undertaken at the end of each course to mark their completion and to prepare for moving on to a new level of understanding based on what has been learned. Our Druidry draws more direct inspiration for our practice from history, archaeology and surviving medieval literature than others we have seen. We have, for example, reconstructed systems of meditation, spiritual development and healing based on medieval Irish texts. We are not, however, Celtic Reconstructionists. We adapt ancient inspirations for the modern world. We do not claim to be reconstructing Druidry as it was, 5,000, 2,000 or a 100 years ago. We use 21st century methods such as incorporating links to web-based resources into our course booklets and delivering those booklets as pdf files. 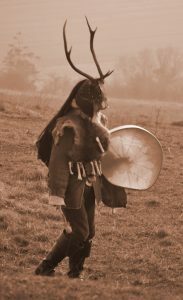 We believe that Druidry is a way to connect more deeply with our own times, not to escape to some mythical other time. We freely acknowledge that Druidry is a broken tradition and are open about the fact that we can only successfully recreate it for our modern world by looking to other, similar traditions, that are either better recorded or, in some cases, still extant. We do not try to hide our debt to these other traditions by pretending access to unknown manuscripts or secret oral teachings. Several of these things differentiate the BDO from other groups but are things we have in common with OBOD. In knowledge of the history of the Druid tradition, for example, Philip Carr-Gomm and I are pretty evenly matched, though we may use our knowledge in different ways or emphasise different aspects of it. Philip and Stephanie Carr-Gomm have been friends since I first met them in about 1990. Many members of the BDO are also members of OBOD, myself included. Our takes on Druidry are different but compatible. 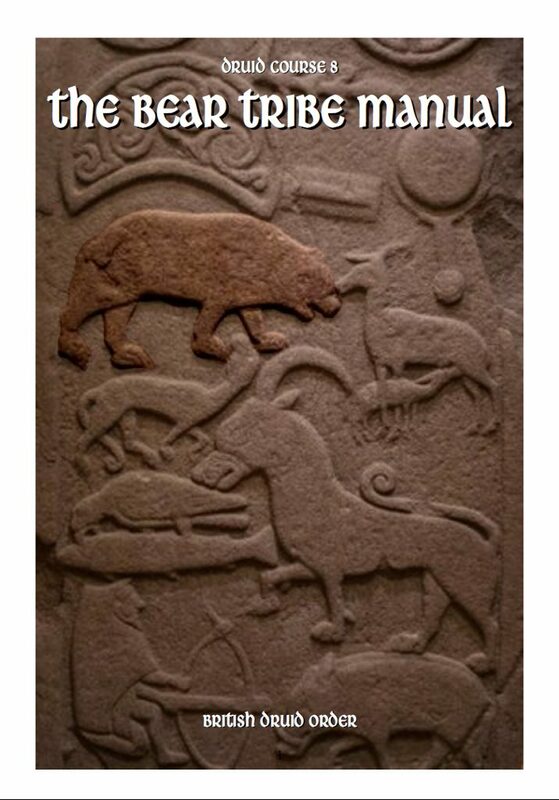 Along with The Druid Network, the American ADF and others, we represent a spiritual Druidry that differentiates all of us from the cultural Druids of the Welsh Gorsedd or the social Druids of the Ancient Order of Druids and its offshoots. But within that overall sense of Druidry as a viable spiritual path there are variations in understanding and presentation, differences in style and emphasis. These often derive from the different personalities of the groups' founders. I my own case, my background in Hinduism, Zen Buddhism, Taoism, Ritual Magic, the Hebrew Kabalah and Wicca all feed into my understanding of Druidry. So do the visionary experiences I've had since childhood that eventually drew me into a practice of Druidry that has been described as 'shamanic.' 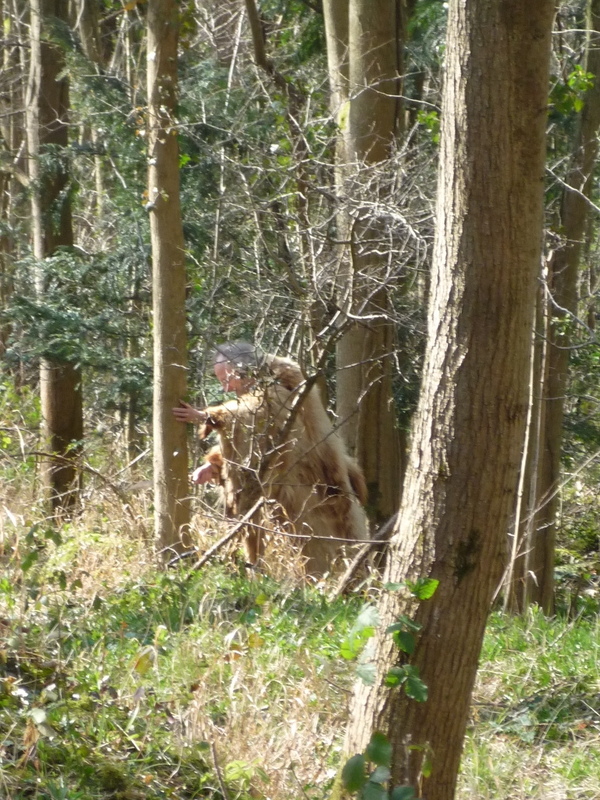 Ronald Hutton once described me as "a shaman quite convincingly disguised as a Druid." 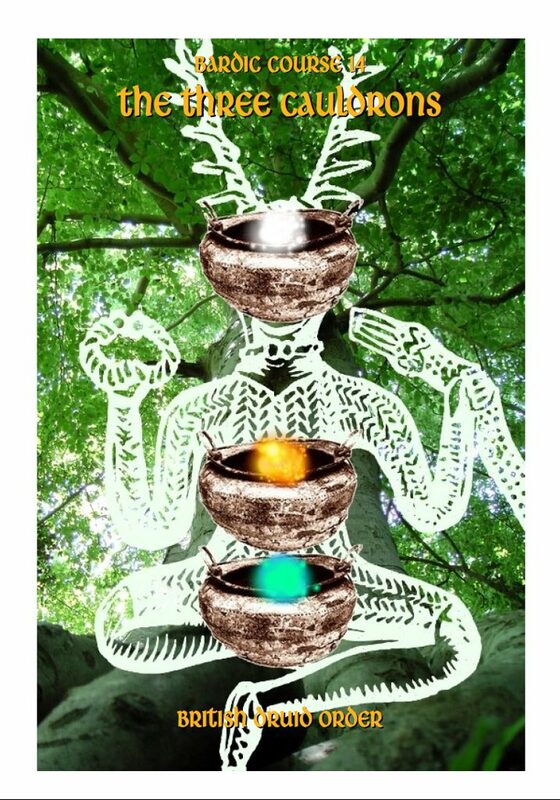 One of the remarkable things about Druidry is that although (perhaps because) we know very little about what Druids did in their heyday 2,000 and more years ago, we have been recreating Druidry almost ever since, re-moulding it every time in line with the needs and aspirations of our own times. The type of Druidry we recreate, adopt or associate with depends very much on our own needs and aspirations within our changing times. There will, therefore, always be room for many Druidries, appealing to different needs. Each group represents one band within the great rainbow that is contemporary Druidry. The picture below shows a joint ritual with members of the BDO and OBOD on Dragon Hill by the Uffington White Horse, during the visit of The World Drum in May, 2008.